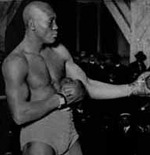 John Arthur "Jack" Johnson remains one of the more colorful figures in boxing history. He became the first Black world heavyweight champion on December 26 1908, defeating Tommy Burns on the fourteenth round. He would lose only five of ninety seven professional fights. Success did not come easy for Johnson. Flamboyant and prone to daliances with White women, his very presence was known to cause White-driven race riots. He was considered one of the most hated men in America during his career. Eventually, the Mann Act--which made it illegal to transport a woman from one state to another for the purposes of an "immoral" act--was used to chase him into exile and away from boxing for a time. It is worth noting that on April 18 1922 a John A Johnson received patent #1418121 for the wrench. It appears that these are the same men; however, I am not sure. Years after his death, he would be elected in the Hall of Fame as a charter member. He is considered by many to be the greatest boxer in his weight class of all time.